All about William Charney, Captain Biff Windsock. 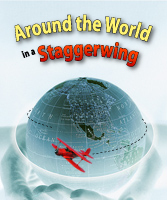 Captain Biff's Journal as he flies around the world in his beloved Red Rockette Beechcraft Stagger Wing. The fascinating history of the Staggerwing Beechcraft airplane of the 1930's. Books recommended by Captain Biff. Contact William M. Charney of Charney Aviation International.